I feel like 2016’s already starting to look not so bad right now, as a lot of what we were whining about in that (un)fateful year is still here. Also, one of the positive remnants of 2016 we’re still left with is the year in film that was, as we head into award season. Which, I don’t really have anything to say about since I avoided watching the Golden Globes – which apparently were kinda sorta culturally relevant this year – by instead spending that night seeing one of the movies on this list. And for maybe the first time I can remember, I think we’re doing these lists before any of the Oscar nominees have been announced, so how about I just get to talking about my favorite movies from last year based on their own merits? Like every improv show ever performed, this movie isn’t perfect. 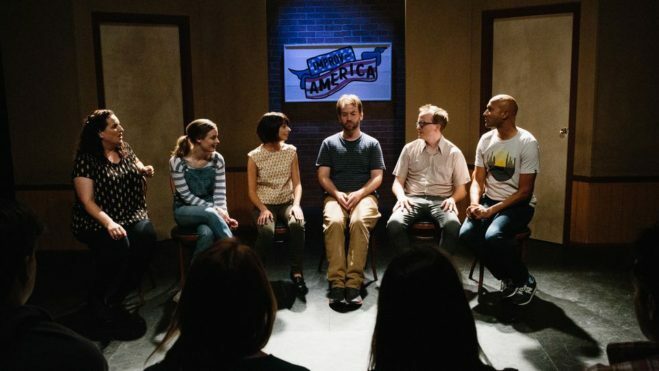 But what it gets right about the world of comedy, improv, and young creative-types in the thralls of that weird transitional period from your 20s to your 30s is pretty spot on. Also, considering 2016 was more or less the year I gave up on improv, it was nice to have this movie to remind me that sure, improv is fun and collaborative and forces you to live in the moment. But it’s also one of those things that can’t last forever, and in turn forces you to question whether that moment has passed. Which many of this film’s characters are asked to wrestle with while providing equal amounts of laughs and pathos. 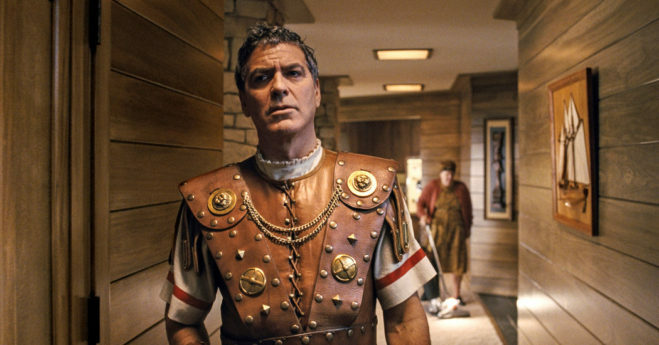 Like all Coen brothers movies, I’m just going to assume that Hail, Caesar! is a film that’s intriguing on its first viewing, but truly reveals its brilliance on a second viewing. Unfortunately, I’ve only seen Hail, Caesar! once. So I still have to lean on that preconceived notion to convince myself that this movie is even better than it was on my first viewing, which I happened to enjoy a lot. I also probably felt even more affinity for the film’s subject matter after delving into the old-timey Hollywood podcast You Must Remember This, which did a series on the ’50s blacklist in Hollywood this year, a subject that now seems just as timely as ever. Oh, and there’s also some damn fine sailor dancing and hilarious word-mangling in this film as well. This is that movie I was talking about seeing the other night during the Golden Globes, so this heavy film about God and faith and man’s helplessness in the face of a greater power is still kinda rattling around in my head at the moment. Also, I can’t say with certainty if this is the best of Martin Scorsese’s religious-themed movies, since The Last Temptation Of Christ is more or less the only Scorsese movie I haven’t seen. But I can say that Silence is a movie that’s surprisingly both for and against organized religion, while depicting the struggle of a true believer’s faith in a way that’s real and tangible for the viewer, even if the existence of God is something you’ve never pondered the believability of (you jerk redditer). There were two movies from 2016 that I liked which took a somewhat similar approach to depicting a devastating act of gun violence that shook America to its core in a decade that still seems more turbulent than the one we’re living in now. The first one being Jackie, which attempted to put us right there in the shoes of Jackie Kennedy during the days surrounding the assassination of her husband. 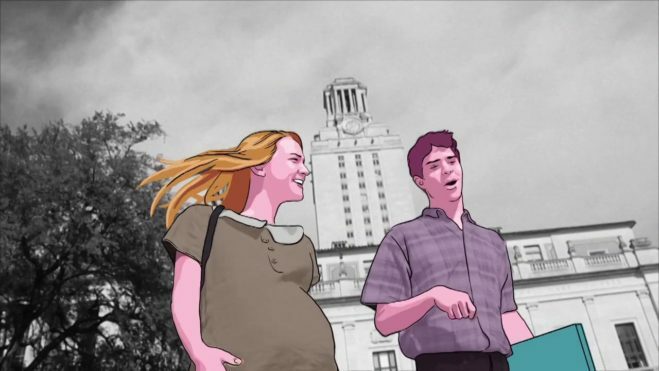 The other one being Tower, a documentary about the mass shooting that happened on the campus of The University Of Texas Austin in 1966, and tries to put us in the shoes of the people that were there the day it happened. It does this through a rotoscoping technique that makes us believe we’re interviewing the subjects the day it happened while also giving us some reflection on the event 50 years later, and how these survivors are still able to find humanity in a day that seemed so completely bereft of it. I feel like my blurbs about these have gotten progressively longer as I keep getting more impassioned about my picks, but I don’t know if I have much in the way of explaining the weird delights of The Lobster. It’s a film that lives in its own bizarre little universe (literally and figuratively) with its absurdist vision of a future in which lonely people are sent to a resort in which they are forced to find a mate or be turned into an animal of their choosing. And instead of trying to explain this movie’s distinct blend of deadpan humor and morbid dystopian paranoia, I’ll just say it needs to be seen to believed. The same can be said for Colin Farrell’s performance, for which I think the guy at least deserves an Oscar nomination, but probably won’t because this movie’s “too weird”. Oh well. I’m not sure what to make of the fact that both of the great movie musicals to come out last year explored subject matter that harkens back to awkward periods in my life that are thankfully over. One of course being La La Land, which gave me some flashbacks to my short stint of chasing dreams in the City Of Angels, while Sing Street couldn’t help but bring me back to my teenage years of playing in rock bands, despite barely being a functioning musician at the time. 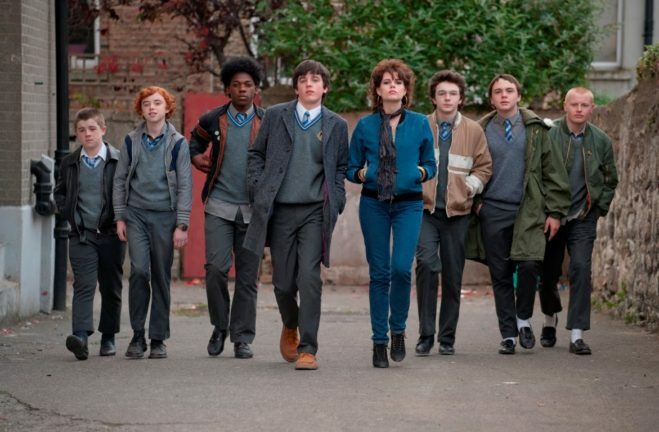 But I think if there’s anything Sing Street proves, it’s that this kind of amateurish enthusiasm can be just as charming as the most perfectly executed song and dance. And even though I think the quality of the movie’s songs is debatable, its scrappy infectiousness is anything but. Sean mentioned in his list how movies are a celebration of sight and sounds, and this is another film that I think kind of embodies that. 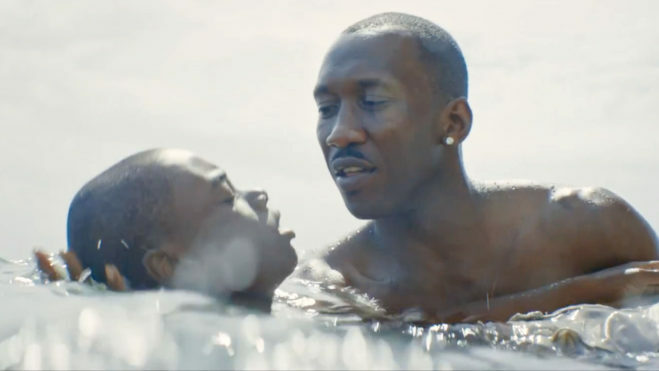 Moonlight not only has a great constantly shifting orchestral score, but also features some of the most arresting imagery of any movie from last year. And I think that’s where the movie’s strengths lie – the fact that it never relies too heavy on plot or explanations, and just lets its small-but-profound moments linger. And in the process, takes a story and a type of upbringing that one would think could evoke nothing but pain, and turns it into something beautiful. I enjoyed Everybody Wants Some!! the first time I saw it in theaters, I enjoyed it the second time after I bought it on Blu-Ray, and I’ll probably enjoy it the next time I watch it at the end of some unconstructive summer, the way I have at summer’s beginning with Dazed And Confused in so many years past. Because let’s be honest here, I’m a total Richard Linklater fanboy, and I think the streak he’s been on with Boyhood, turning the Before series into one of the best trilogies ever, and now this, he’s deep into one of the better stretches of his idiosyncratic career. But I still think Everybody Wants Some!! had plenty of surprises to offer, since I wouldn’t have expected even Linklater capable of making a bunch of obnoxiously confident jocks into sympathetic characters. But I guess when it comes to movies, you can find empathy anywhere, it’s just a matter of knowing where and how to find it. It takes a movie like La La Land to remind me how dumb and futile my stubborn contrarianism is. Because it’s probably pretty likely that La La Land will become something of a powerhouse this Oscar season, which I feel like has already made it ripe for backlash. But I don’t care. I’m a total sucker for old-fashioned Hollywood musicals, and I think the fact that I was forced to abandon my former favorite movie of all time (Network) by kind of living through it in 2016, and also being forced to rewatch my other favorite movie of all time (Singin’ In The Rain) coupled with the release of La La Land, that love for a certain type of musical isn’t going anywhere. And on top of that, I just think La La Land is an immaculate product from the top down. The songs, the choreography, the cinematography, Emma Stone’s career-defining star turn – all of it is top notch, and if you really want to knock it for it’s story, then please, feel free to present me with any great movie musical in which the story is the best part. Instead, the joys of La La Land lie in feeling the very high high’s and the very low low’s in every fiber of your being as you watch this thing, and I can’t wait to relive those emotions on subsequent viewings. Speaking of subsequent viewings, I think I mentioned in my review of Manchester By The Sea that it’s a film I could imagine revisiting sometime in the not too distant future, while I’m sure for some people it’d be hard enough getting through this film once. And I realize now that that may have to do with the fact that none of my close family members have died within my lifetime, which of course is very lucky, but also isn’t something that will last forever. 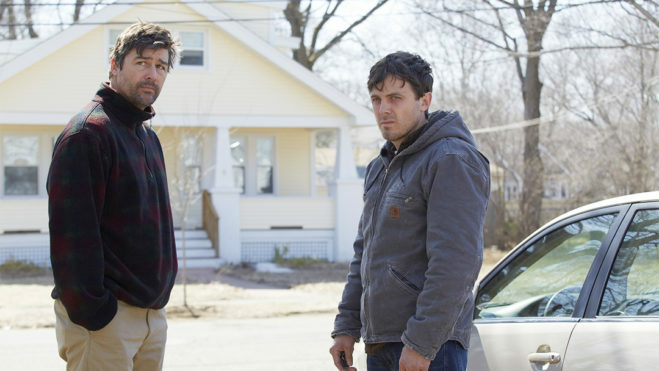 So perhaps it was a little easier for me to process Manchester By The Sea‘s themes of grief and loss with some degree of detachment, but I think whatever your relationship is with death, it’s hard to view this movie without becoming completely wrapped up in these characters and their circumstances. In addition, I think writer/director Kenneth Lonergan does all this with such a deft touch that the movie’s worth seeing just for the unbelievable way in which it shows such tragic moments in such down-to-Earth, and often humorous ways. I also think it’s a film worth seeing on a kind of therapeutic, cathartic level, as it has a very subtle way of showing how people move through feelings they were never built to feel. And in the process, shows that no matter your baggage, it’s always possible to keep moving forward.